A bell was ringing far away but at the same time it sounded loud and clear. I dragged myself from a deep sleep and looked at my watch. It was still dark and my watch indicated 0400. Where could I be and what was I doing there? Slowly my head cleared and I started to remember. 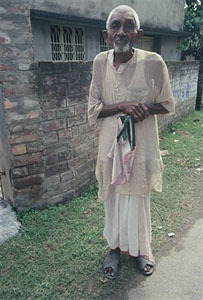 I was in India, in West Bengal and the bell probably indicated that it was time for early morning prayers. I was not in the mood for praying and went back to sleep. My story begins some years earlier in Wellington, New Zealand where my eldest daughter Karen began her relationship with the Hare Krishna movement. During the years that followed I found myself totally bewildered at both this new relationship and my lack of knowledge of what really lay behind the words "Hare Krishna". In October, 2006 I decided to meet my daughter in India and travel together to Mayapur in West Bengal where I hoped to learn a lot more about the Hare Krishna movement, its history and beliefs. Our journey in India began at Kolkatta airport. A taxi met us to take us to Mayapur and although the distance is only about 150 kilometers, it took us about three hours to cover the distance. The road was narrow and pot-holed with heavy traffic in both directions. The continuous heavy use of the horn as a means of communication to other drivers still echoes in my ears. We drove through a number of villages separated by fields where bullocks and farmers ploughed the rich brown soil. The villages were traffic bottlenecks allowing us time to absorb the noise of trucks, buses and scooters arguing for space. Commercial life took place on the main streets, where people negotiated sales or just gossiped. There was no air conditioning in the car and with the temperature over 35 degrees, together with a high humidity thrown in, we felt overwhelmed by both the heat and bumpy ride. On the way my daughter and I noticed the considerable amount of water still lying around in the fields and villages. We discussed the flood damage at Mayapur that Karen had heard about previously when some 2 weeks earlier the Indian authorities had decided to open the dam gates known as the Farrakah Barrage in one of the upper Ganges River tributaries close to the Bangladesh border in northern Bengal. 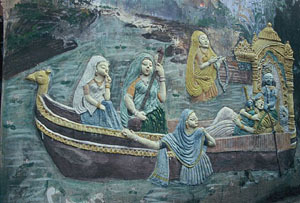 The height of the rushing waters of the Ganges caused massive flooding in the Mayapur area. Until the waters receded the local people and the Hare Krishna devotees used small boats to move around and get to the different buildings inside the complex. We finally reached the Mayapur complex, the world center and headquarters of the International Society for Krishna Consciousness (ISKCON), somewhat exhausted but relieved to have arrived safely. Here we were greeted with more evidence of the flood damage with the flower gardens covered with thick layers of mud and pools of water remaining in the lower levels of buildings. The boats, no longer needed, appeared to have been left where they had been used last. I found it sad and somewhat depressing as everything seemed stained with the same dark brown color and hardly what I had expected. The Administration Office provided efficient check-in facilities for visitors allowing us to reach our room in the Vamsi (flute) building fairly quickly. We could finally relax. The complex is huge with 4 additional buildings including the Gada (club) building which houses the main reception area and dining facilities for up to 450 people at any one time. On the way to our room I noticed a mixture of different people, local Bengalis, a group of devotees from Taiwan and clearly foreign or western devotees all dressed in dhotis (a cotton loose-fitting wrap around and comfortable form of trousers worn by men) or in colorful saris (the women). The place radiated an atmosphere of peace and quiet. Everyone who passed us gave us the traditional welcome of Hare Krishna or Haribol. This warm and friendly greeting made me feel somewhat more comfortable in an environment still strange to me. I began my search for some background and history by asking the devotees, most of whom spoke English and who were only too eager to help me with my many questions. 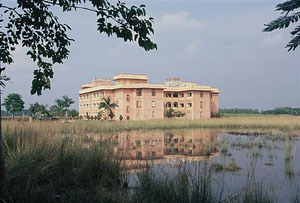 The previous name of Mayapur was Nadia or Navadvipa (in about 1486) and was considered a place of advanced learning. Nava means 9 and Dvipa means island, so it is referred to as the place of 9 islands. Mayapur is located on one of these islands at the junction of the Ganges and Jalangi rivers. One of the major contributions to the importance of Mayapur is due to Sri Chaitanya (1486 - 1534) who was born there. Chaitanya is considered an incarnation of God by the orthodox Gaudiya Vaishnavas (devotees of Vishnu), based on prophecies from the ancient Vedic scriptures and Hindu tradition. My daughter Karen or Krsna Lila (her spiritual name), provided me with some more important background information. 500 years before Gandhi, Sri Chaitanya became an important social reformer inaugurating a massive nonviolent civil-disobedience movement against the occupying Islamic government in India. About 300 years later Bhaktivinode Thakur (1838 - 1914) translated Sri Chaitanya's work into English. In addition he wrote many books that he mailed to academicians and scholarly institutions in both the United States and Europe. His son, Bhaktisiddhanta Saraswati (1874 - 1936) became widely known as the greatest authority on Sri Chaitanya's teachings and highly respected in his own right. We were fortunate enough to be able to join a group of devotees and visit the original homes of both Bhaktisiddhanta and Bhaktivinode. These houses were well preserved as befitting their important historical nature with the owner's original furniture and utensils still in place. 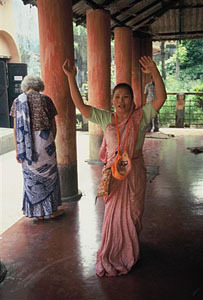 Nearby temples also offered a welcomed opportunity for the devotees to pray and subsequently listen to an explanation of the history of the surroundings. Inside each temple there were Deities, (which are, as I understand, representative forms of the Lord for purposes of worship) that remained protected behind wire screen doors which were opened at certain times for prayers. On one occasion that I vividly remember at the Temple of Gauri Das (a place visited by Lord Chaitanya) there was a large open space in front of the alter allowing the devotees to move around freely where they chanted and danced ecstatically to the beat of drums. 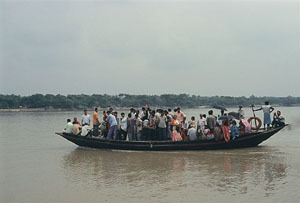 To visit these different places required both the use of rickshaws and local boat transportation. These boats were made of wood and carried 40 to 50 passengers. They sometimes carried bikes and live stock when necessary. Recent modernization has replaced the traditional oars and poles with small outboard motors. 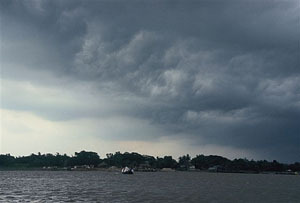 On one of these boat trips, while returning to the Mayapur complex, we were caught in a severe storm accompanied by thunder and flashes of lightening that lit up the whole sky. I was reminded of how small and helpless one can be when confronted by the awesome power of Mother Nature. Karen told me that it was Bhaktisiddhanta who encouraged his disciple, Swami Prabhupada to travel to the west. In 1965, Srila Prabhupada, as he is called by his followers, sailed to the United States at the age of 69. In spite of arriving alone and penniless, within a year he founded the International Society for Krishna Consciousness known as ISKCON. This new religious movement gradually spread to every country in the world and today numbers some hundreds of thousands of full time members. ISKCON identifies itself with Hindu Vedic philosophy and Vaishnavism with its beliefs deeply rooted in the Hindu text Bhagavad Gita, the "Song of the Lord". Most mainstream Hindus accept the Hare Krishna as an authentic sect within Hinduism. 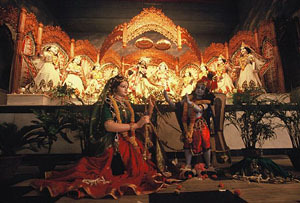 The Hare Krishna devotees worship the Hindu God Krishna as the one Supreme God. Their goal is "Krishna Consciousness" and their central practice is the Hare Krishna mantra for which they are named. I was told by a devotee that this mantra expresses devotion to Krishna where Krishna and Rama refer to God himself and Hare to "the energy of God". The chanting is believed to bring about a higher state of consciousness when it is sung or during meditation. 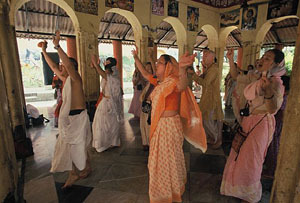 Devotees of Hare Krishna are well known for their expressive singing and dancing, often in public places. Men can be seen dressed in white or saffron robes and often have their heads shaved except for a topknot. Women wear brightly colored saris. 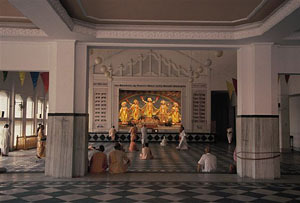 Student members of the Hare Krishna movement live in temples and are expected to lead austere and ascetic lifestyles in which they eat no meat, fish, or eggs; drink no alcohol and take no drugs (including caffeine); do not gamble and remain celibate except for purposes of having families. The land on which the Mayapur complex is situated was acquired in the early 70's and consisted of some uncultivated rice fields. Today it consists of more than 2000 acres (about 8 sq. kilometers) of which 95% is agricultural used mostly to grow rice with the remainder developed for seasonal vegetables and flowers. The water table level is very high in Mayapur and as a result water is very accessible contributing to the growing of rice as a major source of food. There are about 1200 devotees living in the complex of which some 400 are celibate Bengali students living in their own buildings. Included in these figures are families and children mostly from an international background who live in western style buildings and apartments. There are also 4 schools in the complex where boys and girls receive an education that is both secular and religious. These children are taught in English mainly by people from the West. It was here that we met Bhakti Vidya Purna Swami who comes from a Jewish American background, has spent some time in Israel and now prepares courses in religious topics together with philosophy. In spite of the rather limited time we could share, it was clear that here was a person of high integrity who had traveled a long way to find a spiritual framework in which he could live happily. Most students upon graduation have a number of work options that include being sent around the world to teach and propagate what they have learnt in Mayapur. Life is almost entirely self-contained within the complex with a number of small shops located on the inner wall near the main entrance selling traditional religious artifacts, clothes and food. Close to the important pharmacy and medical services there is a small restaurant (Govinda's) providing tasty food and is also a convenient meeting place. Everywhere I wandered I found people most friendly and helpful. During my exploration of the complex in search of material to photograph we would often stop by a booth opposite the memorial temple owned by a charming Bengali couple for both a short chat about life in the complex and a drink of sugar cane juice that they produced on the spot. On one occasion we were told of a devotee about 50 years old who had died during the night. He was to be cremated that day and in the meantime was lying on a stretcher near the memorial temple. Each eye was covered with a flower. A small group surrounded him chanting softly while paying their last respects. Although I did not know the person, I felt strangely moved by the way these people treated both death (of the body) and the surviving spirit of the dead person. I was unable to take any pictures due to my confused feelings. Beyond the old building housing the internet facilities I found the local laundry using traditional hand or rather foot washing techniques where women use their feet to "massage" the soiled clothes in soap and water. Nearby and identified by the smell is the cowshed accommodating some 300 cows producing all the milk requirements for the community. One of the main contributions to the community in which the devotees live consists of food distribution to the local people. Once a week I noticed long queues of people lined up outside the complex and when I enquired regarding the reason, was proudly told of the fact that up to 2000 people get a full meal for 8 rupees (less than 1 Israeli Shekel). In addition there is free prasadam (sanctified food) available outside the entrance to the main temple every day at about noon. 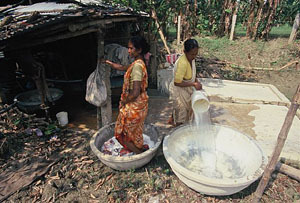 The distribution of cooked food also occurs in times of hardship such as during the yearly flooding of the Ganges River. Another reason for the location of the Mayapur complex is clearly the proximity of the Ganges River or known locally as Ganga and is only a short walk from the complex. 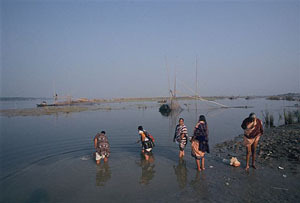 As a result of the easy access, most visiting pilgrims take a ritual bath believing it contributes to the purification of their sins. I also tried this ritual a couple of times but feel that I still have a few sins lurking around! There are between 45,000 and 125,000 pilgrims visiting the Mayapur complex each month. Most pilgrims come for a day's visit from nearby towns within a 50km radius of Mayapur. I visited both temples in the complex that provide major centers of religious activities for both local and foreign visitors. The first and most visually impressive temple is the Prabhupada Samadhi Temple and was built in honor of Srila Prabhupada. It is one of the biggest attractions in West Bengal attracting most of the pilgrims who visit Mayapur. This circular building was completed in 1996 when the inauguration took place. My daughter was particularly fortunate to be present at the time. The building is 60 meters high and the huge dome on top is covered with white marble and a golden steeple. 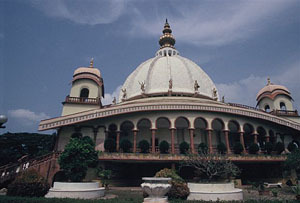 There are 3 meter statue figurines placed around the outside of the dome made of brass, all of which are playing varied musical instruments and standing in different poses. 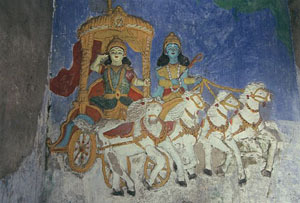 Around the lower outer walls of the building there are numerous terracotta art relief pictures depicting Lord Krishna and Sri Chaitanya. Inside the temple there is a statue of the founder of the movement and a museum in the upper level depicting his journey from Kolkatta to the west in 1965. Looking up into the dome one can see a pictorial representation of Prabhupada's journey made of small colorful ceramic tiles in mosaic form. This art form is magnificent and is a challenge to any serious photographer. I left the memorial temple impressed by the enormous devotion and respect that the devotees clearly felt for their founder. The second temple is known as the Mayapur Chandrodaya Mandir and is the main temple complex housing the Deities. Here most of the day to day religious practices take place. One evening Karen and I visited the temple where devotees were offering lamps in honor of Krishna as a child (Damodar). The two halls were packed with hundreds of people chanting devotional songs. The music was hypnotic and it seemed as if some of the devotees were in a trance as they prostrated themselves towards the Deities. From time to time they also approached the beautifully lit alter and Deities to pay their respects. The air was thick with the smell of incense. I felt privileged to be present at this very special occasion. Another event that I observed was the timeless Diwali festival where lamps were lit throughout the gardens with the devotees chanting outside the main temple in commemoration of Lord Rama and his wife Sita returning from exile in Lanka. The music and lights contributed to a feeling of being somehow in another period of history. Before I realized it my two weeks at Mayapur were over. In this short time I felt that I had traveled to another world where people seemed very different with a personal value system that is in contrast to that of the West. The devotees expressed warmth, friendliness and respect both to each other and outsiders. I also experienced a sense of devotion, not only on a religious level but also to each other and to the community that they serve. As I sadly left my daughter and the Mayapur complex, I noticed the new flowers and shrubs that were already beginning to thrive. On my lengthy return home via Kolkatta and Delhi, I had ample time to recall the many colorful memories and consider a new perspective of the Hare Krishna Movement. For anybody interested in seeing another face of India, I would strongly recommend a visit to Mayapur. The authors can be contacted via the photographer's website at www.meyerimages.com.